But don’t just take our word for it. As Tom Funk writes in Social Media Playbook for Business: Reaching Your Online Community via Twitter, Facebook, Linkedin and More, the principle advantage of a social media program is the opportunity to strengthen the relationship between a company and its customers. According to Mashable, more than half of your customers already use social media for customer service, and by the end of 2013, 80% of companies will use social networks for customer service. “Companies with higher CXi [customer experience] scores tend to have more customers who will buy from them again, who won’t take their business elsewhere and who will recommend them to a friend,” according to a Forrester Research report: The Business Impact of Customer Experience, 2012. The full customer experience can touch sales, customer service, marketing, and even human resources through social media. So it’s important to examine how social media could fit into each of these core areas. Rignite is proud to announce our upcoming #SocialPlus series. This series of blog posts and supportive resources will explore the ways that social media can enhance your company’s business. We’ll look at social media through a variety of different lenses to show where it can deliver the biggest impact on your company. Specifically, we’ll take a closer look at how small-to-medium sized businesses can utilize social media across multiple departments. 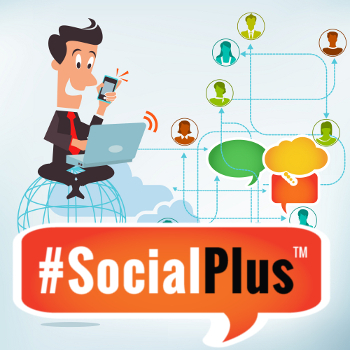 The #SocialPlus series will give you real-world examples of companies in a variety of industries using social to generate real business results. We’ll show you how to drive more sales, provide better service to your customers, increase brand awareness, and improve effectiveness of marketing campaigns through engagement and conversation. This category will focus on how to use social media efficiently within a multi-functional business team. This will span the gamut from improving quality and speed of communication to developing social media policies. In the social plus marketing category we’llcover how social media can enhance overall marketing campaigns, including email marketing, online advertising and more. These posts are designed to empower marketing teams to integrate social media with a variety of marketing tactics to improve the effectiveness and drive business results. This category will help your company turn negatives into positives by providing exceptional customer service online. We’ll provide tips and best practices for personalizing your customer’s experience to turn them into raving fans. Your sales personnel are on the front-line and should have a stake in your company’s social presence. Sales reps can build deeper relationships with prospects, conduct prospect research and even drive sales through social media without becoming a spammer. This category is designed to teach sales professionals how to organically grow their sales database using social media. We hope you are excited as we are about all the great content to come! If you’d like to join the conversation about social business on Twitter follow the #SocialPlus hashtag. Or join the conversation right here and leave a comment with your thoughts and ideas below. Your feedback is always welcome at Rignite. This isn’t only about Rignite’s perspective though. We’d love to hear your feedback. If you have a small or medium-sized business that is using social media exceptionally well in any of our core categories, please contact us at [email protected] We’d love to share your success stories and expertise with the community. Or leave a comment below. Have you incorporated social media into any of these functional areas in your company? What have you learned? And what has been most successful? With Rignite, you can have your whole team on deck to capture social business opportunities. Our software helps small to medium sized businesses turn social activity into real business by making it easy to collaborate across functions and jump on opportunites in real-time with speedy, high quality responses.